Juice Beauty Green Apple Peel Sensitive 2 oz. The Juice Beauty bestselling, patented GREEN APPLEâ¢ Peel with alpha hydroxy acids exfoliates and refines to reduce the appearance of dark spots and discoloration, and visibly brighten the appearance of hyperpigmentation. Delivers spa grade exfoliation revealing a brighter looking complexion.The Juice Beauty GREEN APPLEâ¢ Peel Sensitive is designed for all skin types, 20's and up and is effective for reducing the appearance of hyperpigmentation, dark spots, and uneven skin tone and texture. Benefits:Exfoliates to even skin tone and texture with organic alpha hydroxy acids of malic acid from green apples, citric acid from lemons, tartaric acid from grapes.Visibly minimizes appearance of fine lines and wrinkles with Vitamins A & C.Visibly brightens and reduces the appearance of hyperpigmentation and dark spots with alpha hydroxy organic fruit acids and glycolic acids.Helps clear skin with Vitamin E & organic aloe. 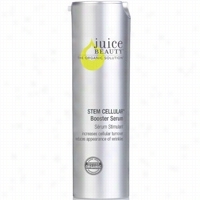 Juice Beauty STEM CELLULAR Booster Serum 1 oz. Reduce the appearance of wrinkles with this ultra-light gel Serum. Power packed with an optimum dose of our proprietary blend of fruit stem cells infused into a Vitamin C, resveratrol-rich grapeseed formula to boost and enhance skin tone and texture. Formulated to maximize the performance of the Stem Cellular Anti-Wrinkle Moisturizer by preparing the skin to absorb rich antioxidant benefits.Juice Beauty's Stem Cellular Anti-Wrinkle Booster Serum is ideal for all skin types and especially beneficial for skin showing the signs of aging including fine lines, wrinkles, and sun damage.Benefits:Renews the skin surface and delivers powerful antioxidant action with Vitamins C, E & B5.Visibly increases skin luminosity with Vitamin C.Fights free radical skin damage and creates firmer-looking skin.Visibly improves elasticity and creates a plumping effect of the skin with hyaluronic acid. 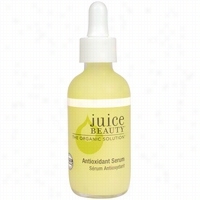 Juice Beauty Antioxidant Serum 2 oz. Clinically proven to prevent free radical damage up to 87%, this lightweight serum feeds your skin with vitamins and antioxidants from certified organic juices, moisturizes with fatty acid-packed plant oils and smoothes the appearance of fine lines with peptides, alpha lipoic acid and CoQ10. The perfect daily vitamin to use after cleansing and before your moisturizer. A Daily Essential for all skin types.Juice Beauty's Antioxidant Serum is designed for all skin types and ideal for daily use to keep skin healthy and glowing.Benefits:Clinically proven to fight free radical damage up to 87%.Creates a firmer-looking complexion & reduces the appearance of wrinkles with peptides.Replenishes moisture with vegetable hyaluronic acid & vegetable glycerin.Feeds the skin with rich nutrients of algae & Vitamins B5.Smoothes appearance of fine lines with alpha lipoic & CoQ10.Fights free radicals with antioxidant-rich, resveratrol from organic grapeseed and grape juice. 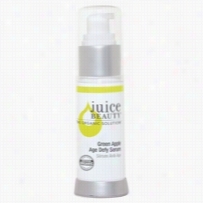 Juice Beauty Green Apple Age Defy Serum 1 oz. Brighten with powerful Antioxidants to help reduce free radical damage that may contribute to the appearance of aging. Visibly reduce the appearance of dark spots and discoloration with an antioxidant cocktail of malic acid, citric acid and tartaric acid for optimum brightening results. The Juice Beauty Green Appleâ¢ Age Defy Serum is designed for all skin types (except sensitive skin), 20's and up and is effective for reducing the appearance of hyperpigmentation, dark spots, and uneven skin tone and texture.Benefits:Visibly brightens to help sun damaged & aging skin with organic apple (malic acid), organic lemon (citric acid), and organic grape (tartaric acid).Creates firmer-looking skin with peptides.Smoothes appearance of fine lines with DMAE, alpha lipoic acid & CoQ10. Creates a plumping effect and decreases appearance of fine lines with vegetable hyaluronic acid.Fights free radical skin damage with rich antioxidants and Vitamin C.
First Aid Beauty Ultra Repair Concentrate 2 oz. 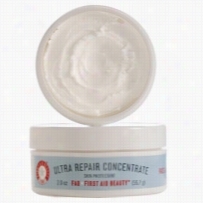 FAB Ultra Repair Concentrate is a must-have beauty essential. This all-purpose beauty balm delivers the healing power of FAB Ultra Repair Cream in a concentrated, luxurious balm to smooth everything from flyaway hairs to rough patches of eczema. The formula blends waxes, oils, botanical Antioxidants and reparative ingredients, such as Colloidal Oatmeal and Allantoin. It is the ultimate skin beauty elixir for the face and body and the answer to your beauty SOS.Benefits:Soothes and hydrates dry, rough skin.Can be used on the face for excessively dry skin.Reduces redness and scaling.Formula is free of parabens, harsh chemicals and colorants. 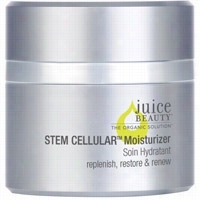 Juice Beauty STEM CELLULAR Moisturizer 1.7 oz. Moisturize with a proprietary blend of fruit stem cells infused into a Vitamin C, resveratrol-rich grapeseed formula to create a visibly firmed appearance of the skin and reduce the appearance of fine lines and wrinkles. Certified organic, antioxidant-rich ingredients and plant oils hydrate and improve elasticity for lasting, advanced age defy results.Juice Beauty's STEM CELLULARâ¢ Moisturizer is ideal for all skin types and especially beneficial for skin showing the signs of aging including fine lines, wrinkles, and sun damage.Benefits:Fights free radical skin damage and creates a visibly firmed appearance of the skin.Hydrates and moisturizes skin with organic antioxidant-rich jojoba and shea.Renews the skin's surface and visibly improves skin luminosity with Vitamin C.Provides Essential fatty acid emollients and powerful antioxidant action with evening primrose, linseed seed & borage seed. 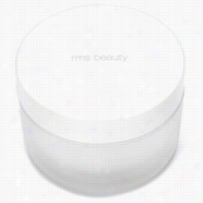 RMS Beauty Raw Coconut Cream 2.5 oz. The ultimate organic beauty product. This can honestly be called the best Makeup remover ever. Removes even the most stubborn mascara with ease. This multitasking product can also be used as a facial cleanser and skin moisturizer. Coconut oil is considered the healthiest oil on earth for its high levels of lauric acid, which is rarely found in nature. Lauric acid is what gives coconut oil its antibacterial, antifungal and antimicrobial properties, making this all-in-one product suitable for even the most blemish prone skin. This natural antioxidant is 100% pure, raw and unrefined thereby naturally protecting one's skin against free radical damage and premature aging. Ideal for all skin types including sensitive and acne-prone skin. Nourishes skin, hair and lashes. Helps sooth sunburns. RMS Beauty Coconut oil is harvested fresh using a new and modern processing technique making it superior over store bought coconut oil and other cold pressed coconut oils on the market. Juice Beauty Blemish Clearing Toner Pad 50 ct.
A daily pad to use after cleansing that will help clarify and deeply clean large pores to help reduce blemishes. This cooling formula soothes skin and promotes even skin tone and texture. Helps manage oil without stripping skin of its natural moisture levels. Each pad is pre-soaked with a powerful solution formulated with salicylic acid from willow bark, cucumber extract and soothing organic Aloe juice.The Juice Beauty Blemish Clearing Oil Control Cleanse & Tone Pads are designed for oily, combination, and blemish-prone skin types.Benefits:Pads are 100% bamboo, which is known to have natural bacterial-inhibiting properties. Bamboo is also a sustainable crop not sprayed with pesticides, unlike cotton, which is one of the most heavily pesticide-sprayed crops.Exfoliates, helps clear pores and manages oil with salicylic acid from willow bark.Tighten pores with witch hazel.Visibly brightens with Vitamin C and organic apple, lemon and grape acids.Soothes with organic aloe and cucumber. Juice Beauty Soothing Serum 2 oz. Soothe your skin and reduce the appearance of redness with this blend of certified organic, antioxidant-rich raspberry and aloe vera juices, licorice and bearberry botanicals, and nutrient-rich essential fatty acids that leaves you with a healthy skin tone.Juice Beauty's Soothing Serum is designed for all skin types and especially beneficial for sensitive skin and helping to reduce the appearance of red, inflamed or aggravated skin.Benefits:Helps calm with organic aloe & raspberry.Reduces the appearance of redness with organic botanicals & flavonoids of primrose, linseed & borage.Soothes with organic cucumber, bearberry, chamomile, and calendula.Replenishes moisture with vegetable hyaluronic acid & vegetable glycerin.Fights free radicals with antioxidant-rich, resveratrol from grapeseed.